Prof. Dr. Dieter Neher (Unversity of Potsdam) and Dr. Thomas Unold (Helmholtz-Zentrum Berlin). By incorporating small amounts of Strontium in perovskite absorbers, the HyPerCells members Pietro Caprioglio, Fengshuo Zu, Christian M. Wolff, Pascal Becker, Martin Stolterfoht and workgroup leaders Norbert Koch, Thomas Unold, Steve Albrecht and Dieter Neher achieved record high Voc values in pin perovskite solar cells of up to 1.23 V and non-radiative voltage losses of only 110 mV. 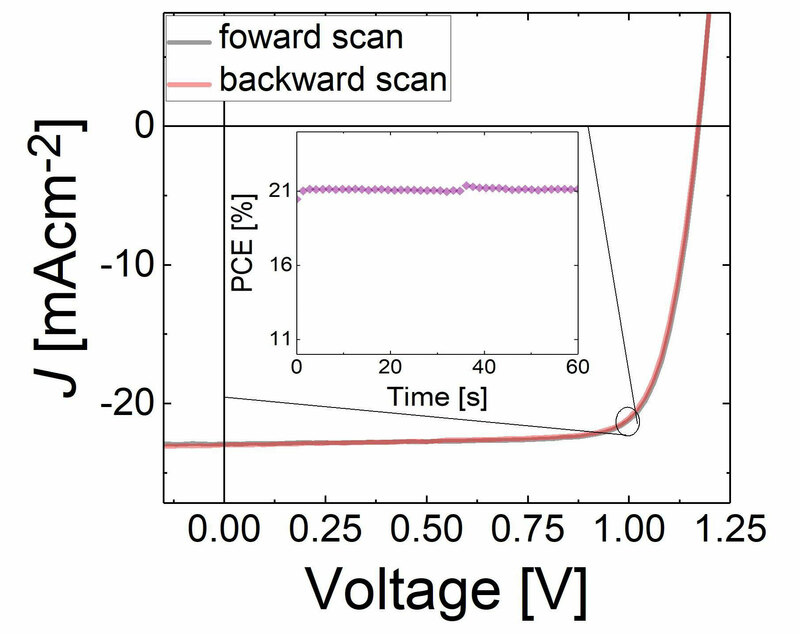 The reduced non-radiative recombination losses are thereby assigned to n-doping of the perovskite surface combined with a locally larger band gap at the surface. Both effects prevent photogenerated holes from reaching the n-type contact and recombining there, similar to the well-known back surface field effect in inorganic semiconductors. The results have recently been published in RSC Sustainable Energy & Fuels. PhD student (m/f) within the HI-SCORE research school: Advancing inorganic perovskite compositions for highly efficient top-cells in tandem devices. Check out the "Open Positions" section for more informations. together with the renowned scientists Michael Saliba (Adolphe Merkle Institute) and Juan Pablo Correa-Baena (Massachusetts Institute of Technology) provide detailed descriptions and explanations on how to achieve highly efficient perovskite solar cells on varios device architectures. 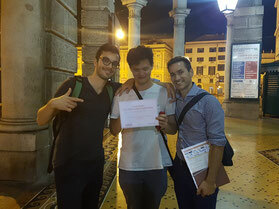 The joint publication also underlines the excellent connection between the HyPerCells graduate school and other leading scientists and research institutes worldwide. As part of a lecture series within the HyPerCells graduate school, it was an honour and pleasure to welcome Prof. Dr. Filippo de Angelis from the University of Perugia at the Helmholtz-Zentrum in Berlin Adlershof. Other prestigious speakers in the series so far were amongst others Dr. Giulia Grancini, EPFL, Dr. Selina Olthof, University of Cologne, Dr. David Egger, University of Regensburg, Dr. Felix Deschler, University of Cambridge, Dr. Jarvist Frost, Imperial College London and Prof. Dr. Henk J. Bolink, University of Valencia. The HyPerCells graduate school meets for the fall retreat 2017 in Akademie Schmöckwitz on October 11.-12. The retreat offers the possibility for members of the graduate school as well as guests to present their recent research results. 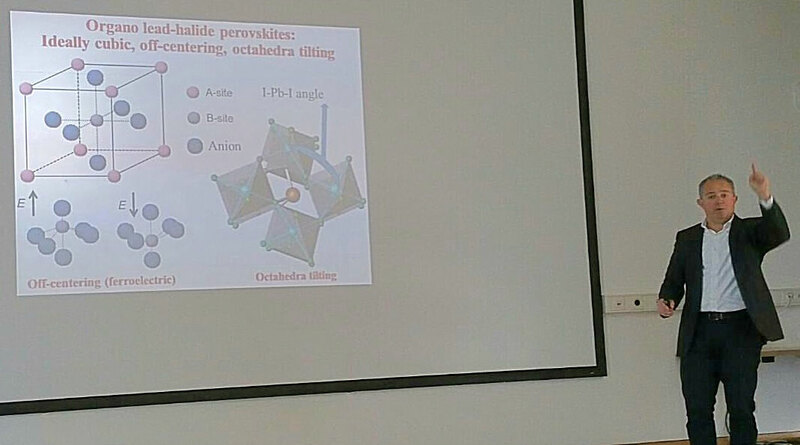 This not only exchanges know-how and experiences but also promotes synergies between researchers from different fields of perovskite research. Perovskite solar cells with record efficiencies of over 20 per cent have been realised by Christian Wolff and Martin Stolterfoht. Following their publication in the journal Energy & Environmental Science they were able to push the solar cell performance up to 21.4 % power conversion efficiency which is the highest value reported so far for "inverted" perovskite solar cells with undoped contact layers. Cross section scanning electron microscopy image of the record solar cell. 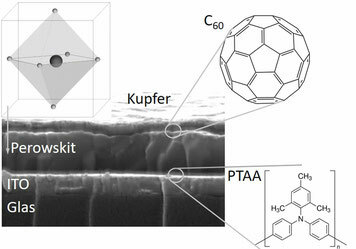 A 350 nm thick perovskite film is embedded between undoped organic contact layers of the fullerene C60 and the polymer PTAA. 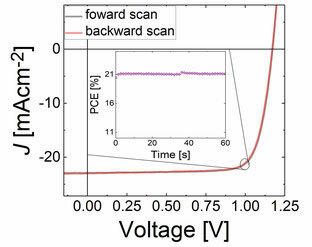 Current-voltage characteristics and maximum power point track measurements of the record efficiency solar cell showing a stabilized power conversion efficiency of 21.4 %. Christian Wolff is awarded with the Nature poster prize for best multidisciplinary presentation on the 2nd international conference "Perovkite Solar Cells and Optoelectronics" (PSCO) in Genova, September 2016. The results presented in his poster have recently been published in the journal Advanced Materials. This Graduate School aims at achieving a fundamental understanding of the material properties and physical processes in organometallic perovskites used for photovoltaic energy conversion. A close collaboration of synthesis, quantum chemistry and physics research groups at the Universität Potsdam, the Max-Planck-Institut für Kolloid- und Grenzflächenforschung and the Helmholtz Zentrum Berlin is intended to lay the foundation for the use of perovskites in tandem solar cells. The work program is designed for a period of 3.5 years and will include about 16 PhD students, out of which 8 will be funded by the graduate school and 8 will be funded from other sources. As of now, all positions have been assigned. 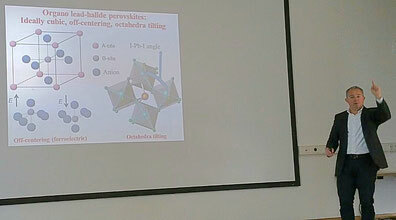 Research on perovskite solar cells is highly interdisciplinary. Therefore, the school will provide the PhD students with comprehensive knowledge and understanding of the chemistry and physics of perovskite-based tandem devices. This program comprises lectures, lab-courses, workshops and seminar, offered by renowned specialists in their respective field. 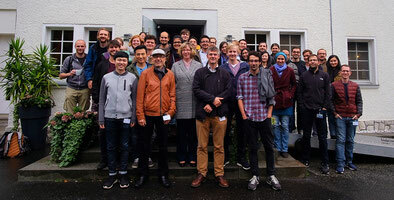 The research-based training will be supplemented by measures to support the provision of key competences, under the guidance of the Potsdam Graduate School (PoGS) of the UP.